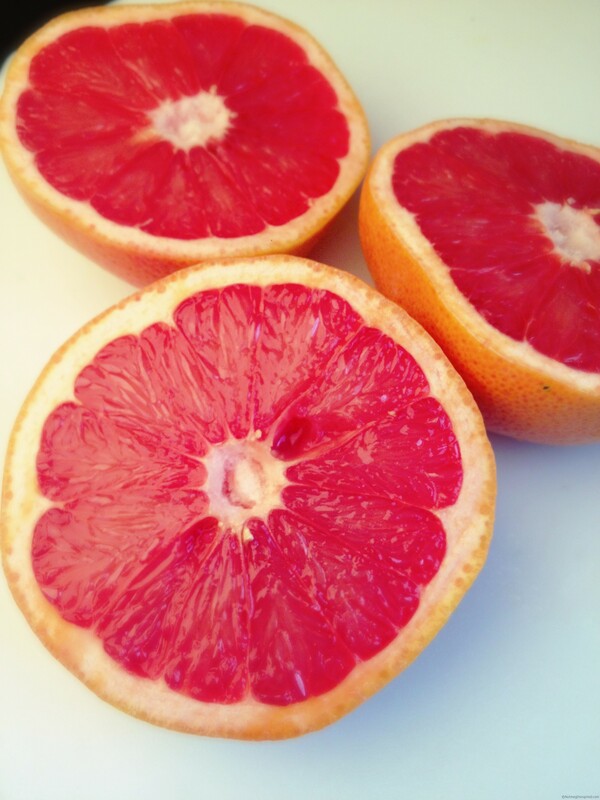 Grapefruit has always been a favorite, ever since I was little. I love the juicy tartness with just a touch of sugar. Definitely a treat anytime of the day. So when we received a very nice looking batch of ruby reds at work I was inspired. 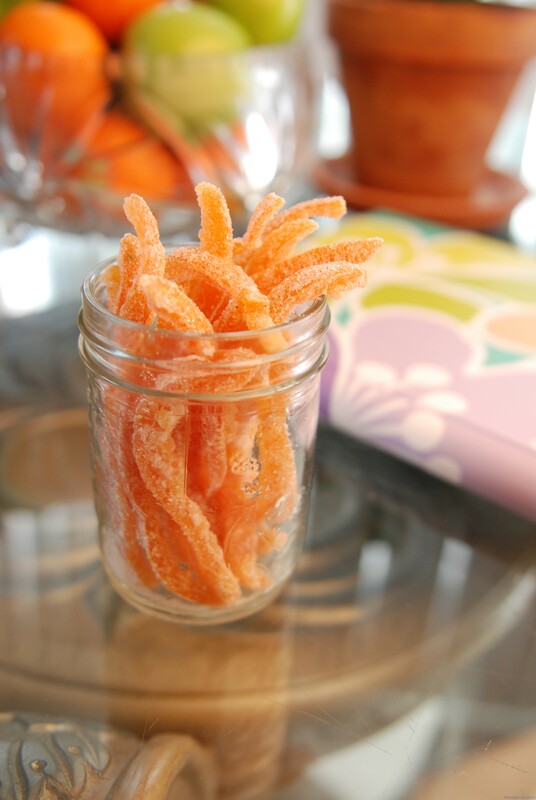 I had heard about sugared citrus rind before and thought this the perfect time to try it. What you end with is something similar to a semi sweet candy with an intense concentrated grapefruit flavour. A must try for any grapefruit lover. I took the jar to work and people were pleasantly surprised at how fantastic it was. Being the new girl I am glad they are receptive to my experiments. I knew I had them when they tried and enjoyed the lentils brownies. Wash the grapefruit very well, I even used a tiny touch of dish soap and made sure I rinsed the fruit a number of times. Cut the grapefruit into quarters and remove the fruit. I did try and remove a touch of the white pith with the edge of an over turned spoon. 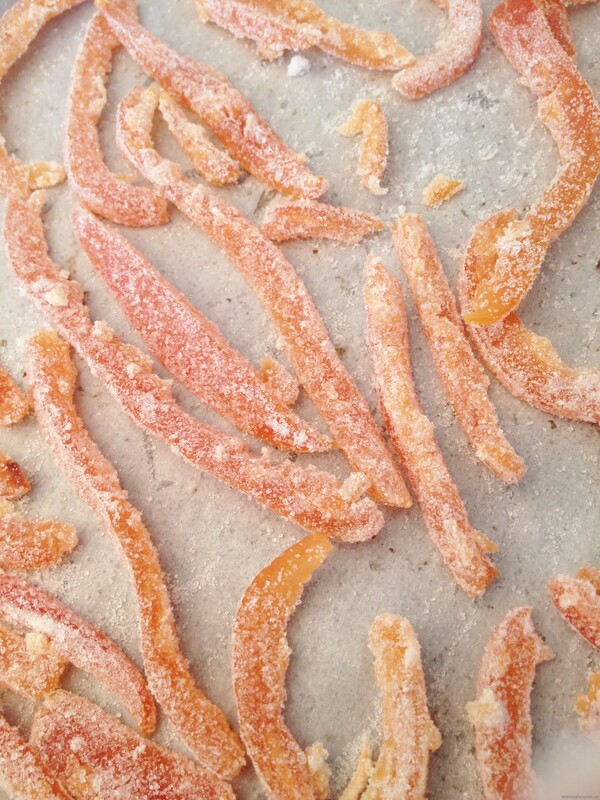 Slide the rind into thin strips. Fill a medium sized pot with the rinds and cover with water. Bring to a boil and let simmer 10 minutes. Strain and repeat this step 3 more times. This is important to remove the bitterness from the rind. You will notice the color has deepened and the rind has a touch of translucency now. In the same pot add 1½ cups of sugar and 1½ cups of water. Stir in the sugar and bring this to a boil. Reduce to medium low and add the strained grapefruit rind. Simmer now until all the liquid is gone. Remove the strips to a rack to dry for 7 hours or over night. Once dry toss in sugar until coated. Place on a parchment lined cookie sheet to dry completely, about an hour. Store in a covered jar. Oh my Mardi! What delicious idea!!! I feel like these would be excellent dipped in chocolate too 😉 I LOVE this idea! There is a cocktail out there in need of a sugared grapefruit garnish! Love this recipe. 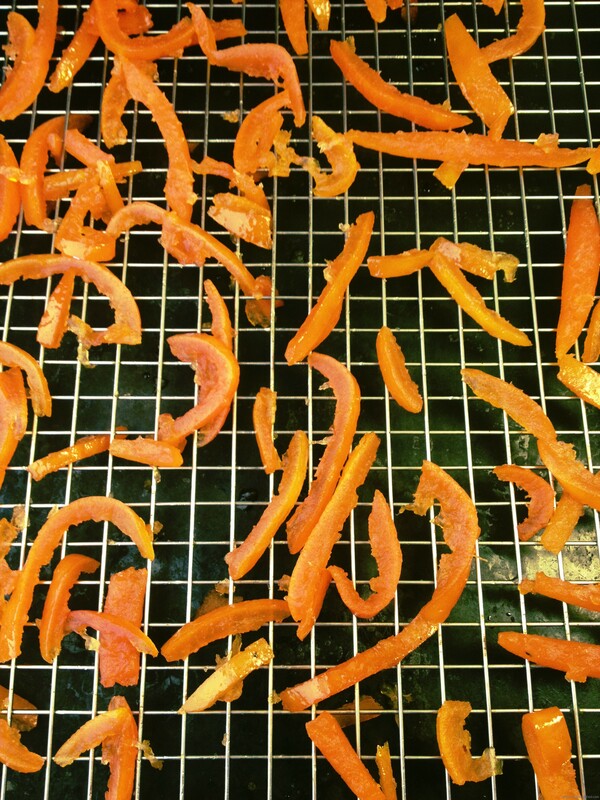 I tried to candy orange peels as a garnish for old fashioneds but they didn’t work out as well. Will definitely be trying this.